Eclectic Momma: I did it! I finished something I started. 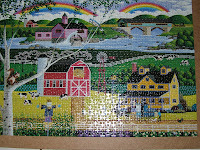 Sunday night I finished my puzzle. I didn't even lose a piece. This is a picture of the finished product. And this is the next one I am planning on beginning tomorrow. Tera helps me some but gets bored quick so I am basically doing them on my own but let her help as long as she feels like it. It has been very therapeutic for me lately. During this transition, I still have days when I get down but having a hobby that I can do with very limited time or energy in the comfort of my living room without special equipment is great. 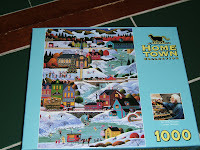 These puzzles cost under $4 at Walmart and are very Americana. I enjoy looking at these kinds of intricate paintings and they are so diverse it makes it easier to put together. Oh well I won't bore you any longer on the ins and outs of puzzles.